Thanks to the increased adoption of Wi-Fi enabled devices and applications, the cloud-managed Wi-Fi market is rapidly growing. Companies like Tanaza allow you to start your business in the Wi-Fi market quickly and easily, with its complete set of features. To offer the best service to your clients, you should adapt your Wi-Fi network to fit the industry you are targeting. Due to its incomparable set of features and reliability, Tanaza has been chosen by many companies worldwide to manage their Wi-Fi network in industries like retail, education, hospitality, healthcare, to name a few…. In the infographic below, we present you with a checklist of the top 5 most indispensable features, according to our customers, based on their applications in different industries. The remote management function is indispensable to all industries. Tanaza allows you to monitor each access point from remote: if an access point goes down, you’ll receive an email alert and will be able to check its status in seconds through the dashboard. Guest access refers to the possibility to create various ways to access a Wi-Fi network. Tanaza allows you to create up to 8 SSIDs per access point, which means that you can adapt the network to fit the kind of users. For example, in the education sector, Tanaza will enable you to create separate SSIDs; one SSID for students, one for administration staff and another for guests. Regardless of the industry in which a network is deployed, this feature is very handy for administrators managing network or networks with multiple types of users. In addition, log in through social media is appreciated by users of mobile that usually have already their social account activated on their smartphone. Through social login authentication, you will be able to collect data about social profile of Wi-Fi users and create a complete database on your Tanaza dashboard. Wi-Fi marketing is a feature that allows you to turn your hotspot into a new marketing tool. By collecting data from the captive portal and analyze it, you will have a clear idea of who your clients are: age, gender, city, name, surname, phone number, email address. All collected data can be analyzed through the Tanaza dashboard or you can decide to export them on a marketing platform like MailChimp (the application is integrated to Tanaza). Wi-Fi marketing is complementary to social login and will help you to increase your visibility and offer tailored services to your clientele. Last but not least, the couponing system gives you the possibility to configure whether your users have free or paid access to your network. It also allows you to control the time of a session, upload and download quota, the number of connected devices per person, and the bandwidth. 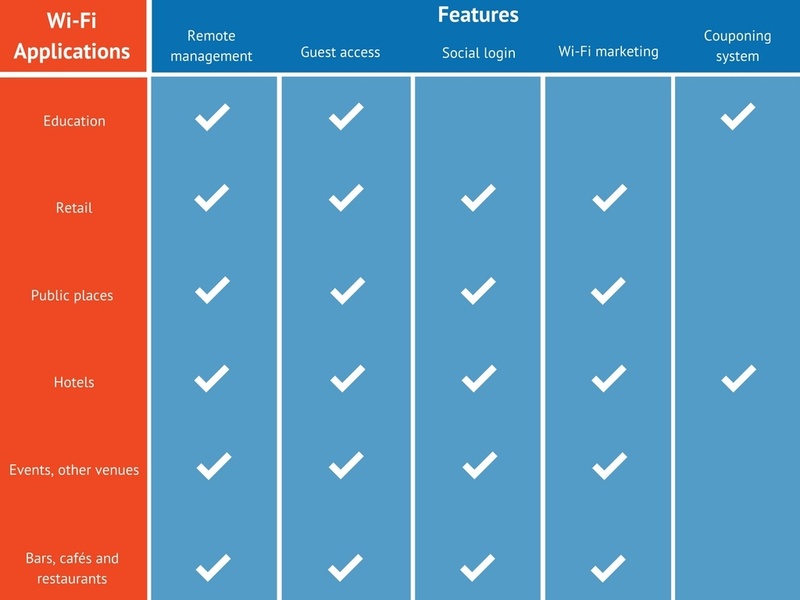 For example, in hotels, guests could initially be given a free 20 minute session on your network and if they wish to extend their session, they can pay based on the amount of time the wish to have a Wi-Fi connection… You are completely free to configure network access as you want! There are tons of possible configurations for your Wi-Fi network and you are free to set up as you like and according to your needs. Tanaza is a scalable software thanks to its multi-vendor aspect and can be easily used whether for a café/restaurant than for a university or a sports venue.